This section shows you how to transfer audio from a Song in Studio One 4 to Revoice Pro using the ARA link plug-in. The picture below shows the layout of the example song. Once you have loaded (or created) your song, select the Audio Events in Studio One that you want to capture, that is, transfer to Revoice Pro. In this example we've selected the vocal audio from the first two tracks (see below). Note: It is possible to select all the audio events in a song at once. To keep this example simple, only the first two tracks will be used. 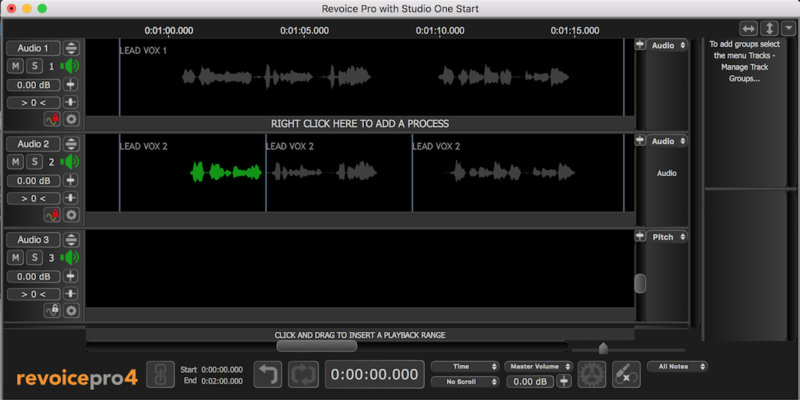 Next, from Studio One's Audio Menu, select Edit with Revoice Pro. This will add the RevoicePro Link plug-in to all the selected audio events. In this example Studio One will add One plug-in to the first track and three plug-ins to the second track. Each Audio Event in Studio One will show a small "Fx" its lower left corner. Clicking the "Fx" will show you the name of the Fxs that you have added. Clicking a name of the plug-in will reveal that plug-in's window. Once you have added Revoice Pro Link, Studio One will display each plug-in labelled with the name of its associated audio event. In this example its label is "LEAD VOX 1". If Revoice Pro is not running, you will see the message "Press the Start button to run Revoice Pro" at the bottom of the plug-in's window. If Revoice Pro is not running, press in the plug-in. 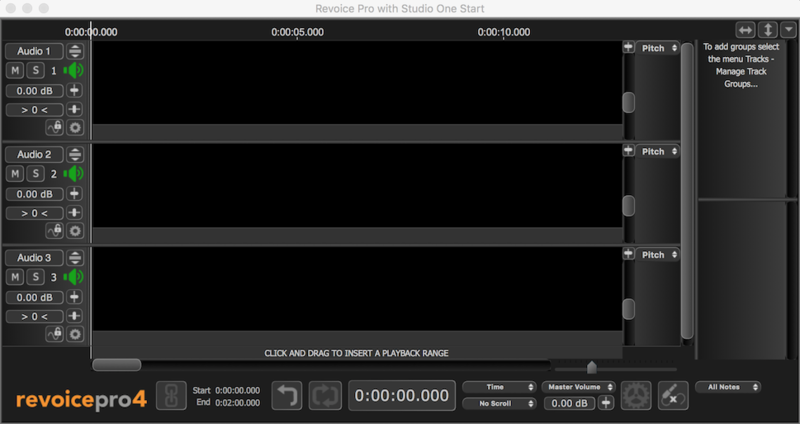 When Revoice Pro is running the Start button becomes a Show button. Press Show in the plug-in to bring Revoice Pro to the foreground on your screen. The plug-in will also show ARA 2 in its lower left corner to confirm that it has been configured as an ARA plug-in. As soon as Revoice Pro is running, Studio One will open an empty Revoice Pro session. The new session will have the same name as Studio One's Song. In this example the Song's name is Revoice Pro with Studio One Start. The next and final step in this section is to choose how to link the tracks in Studio One to the tracks in Revoice Pro. In this example we map the first track of Studio One to the first track of Revoice Pro (named: Audio 1). To do this select any Audio Event that has a Link plug-in on the first track of Studio One, such as LEAD VOX 1. From the drop down menu in the plug-in for LEAD VOX 1 select Audio 1. We also map the second track of Studio One to the second track of Revoice Pro (named: Audio 2). To do this select any Audio Event that has a Link plug-in on the second track of Studio One, e.g. LEAD VOX 2 at the start of the track. From the drop down menu in the plug-in for LEAD VOX 2, select Audio 2. It is necessary to set the track mapping in only one Revoice Pro Link plug-in per track. All the other plug-ins on the same track will automatically follow the same mapping. It is not possible to map different tracks in Studio One to the same track in Revoice Pro. 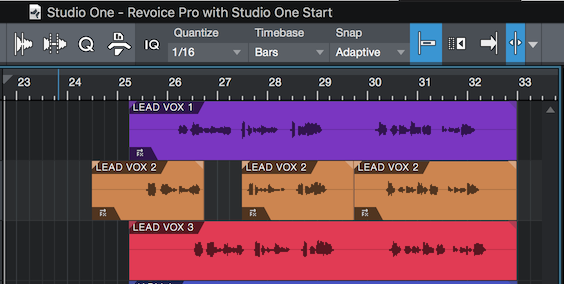 For example, you cannot map both LEAD VOX 1 and LEAD VOX 2 in Studio One to the track Audio 1 in Revoice Pro. 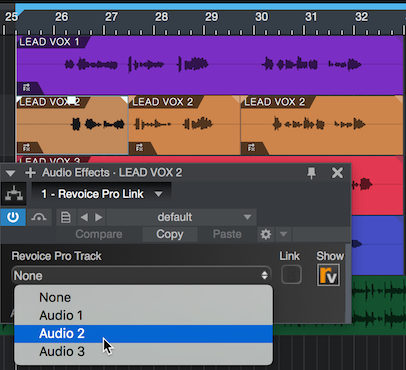 Once you have selected Audio 2 in the Revoice Pro Link, the plug-in's Link icon will glow green. This indicates that Revoice Pro will try to mirror the position and audio content of Audio Event (LEAD VOX 2) in the mapped track (Audio 2). In other words if you change the Audio Event LEAD VOX 2 in Studio One, any changes will be transferred across to Revoice Pro. After having mapped a track from Studio One to Revoice Pro, Studio One will copy all the linked Audio Events to Revoice Pro. 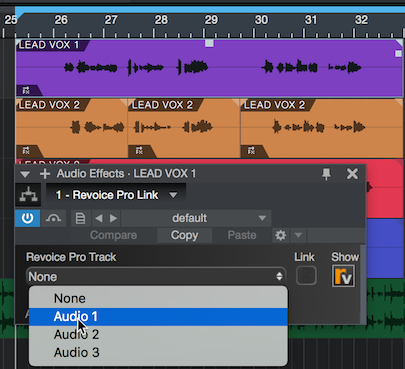 Once you have linked a track in Studio One to a track in Revoice Pro, the track in Revoice Pro becomes locked. The red padlock in the track's status area indicates this. Although you cannot edit any of the linked audio directly in Revoice Pro (as the track is locked), the ARA interface allows the copied audio in Revoice Pro to be synchronized with their linked Audio Events in Studio One. 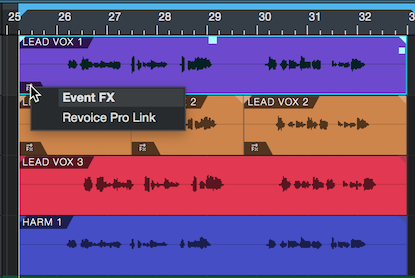 ...results in the linked audio (LEAD VOX 2) in Revoice Pro also being moved to the new time. To unlock a track, it is necessary to remove the Revoice Pro Link plug-in from all the Audio Events in the corresponding track in Studio One. 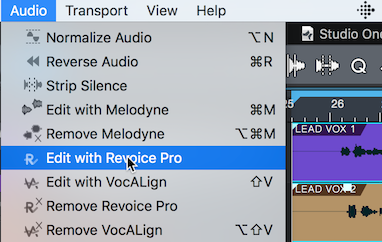 For example, if you need to unlock track Audio 1 in Revoie Pro, in Studio One you will need to remove the Revoice Pro Link plug-in from Audio Event LEAD VOX 1. In Studio One use the menu function Audio->Remove Revoice Pro to remove the plug-ins from selected Audio Events efficiently. 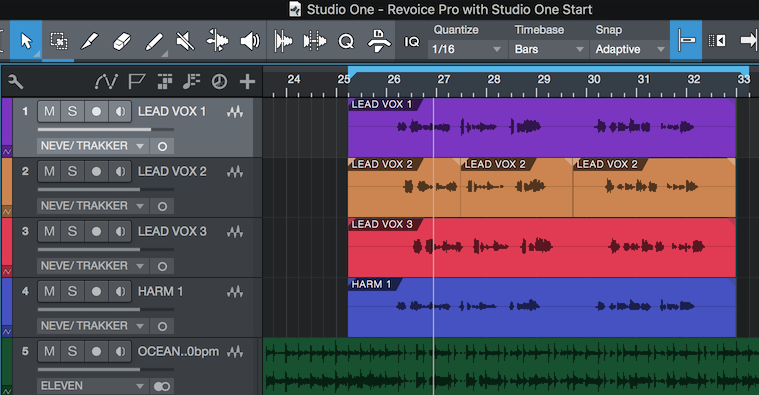 You may want to stop a track in Revoice Pro from automatically following changes in Studio One. To stop the automatic updating in Revoice Pro, click Link click the Link icon , in the Link plug-in's window. The icon will turn grey and the track in Revoice Pro will no longer follow any changes that you make in Studio One.